The 1876 Democratic National Convention at the Merchants Exchange Building in St. Louis, Missouri. A United States presidential nominating convention is a political convention held every four years in the United States by most of the political parties who will be fielding nominees in the upcoming U.S. presidential election. The formal purpose of such a convention is to select the party's nominee for President, as well as to adopt a statement of party principles and goals known as the platform and adopt the rules for the party's activities, including the presidential nominating process for the next election cycle. In the modern U.S. presidential election process, voters participating in the presidential primaries are actually helping to select many of the delegates to these conventions, who then in turn are pledged to help a specific presidential candidate get nominated. Other delegates to these conventions include political party members who are seated automatically, and are called "unpledged delegates" because they can choose for themselves for which candidate they vote. Generally, usage of "presidential campaign nominating convention" refers to the two major parties' quadrennial events: the Democratic National Convention and the Republican National Convention. Some minor parties also select their nominees by convention, including the Green Party, the Socialist Party USA, the Libertarian Party, the Constitution Party, and the Reform Party USA. The convention cycle begins with the Call to Convention. Usually issued about 18 months in advance, the Call is an invitation from the national party to the state and territory parties to convene to select a presidential nominee. It also sets out the number of delegates to be awarded to each, as well as the rules for the nomination process. The conventions are usually scheduled for four days of business, with the exception of the 1972 Republican and 2012 Democratic conventions, which were three days each. (The 2008 and 2012 Republican conventions were also three days each, but in each case was shortened from the scheduled four days due to weather issues). There is no rule dictating the order of the conventions, but since 1956 the incumbent party has held its convention second. Between 1864 and 1952, the Democrats went second every year (except for 1888). In 1956, when Republican Dwight D. Eisenhower was the incumbent, the Democrats went first, and the party out of power has gone first ever since. (Between 1936 and 1952, the Democrats were the incumbent party and went second, but it is unclear whether they went second because they held the White House or because they had always gone second.) Since 1952, all major party conventions have been held in the months of July, August or (for the first time in 2004), early September. (Election laws in some states would likely prevent conventions from moving into mid-September). Between the middle of the 20th century and 2004, the two major party conventions were primarily scheduled about one month apart, often with the Summer Olympics in between so they did not have to compete for viewers. In 1996, both were held in August to accommodate the Atlanta Olympics in July, the last Summer Olympics to date to be played in the U.S. In 2000, both conventions preceded the Sydney Olympics in late September. In 2008 and 2012, the Democratic and Republican conventions were moved to back-to-back weeks following the conclusion of the Olympics. One reason for these late conventions had to do with campaign finance laws, which allow the candidates to spend an unlimited amount of money before the convention, but forbid fundraising after the convention, in order for the parties to receive federal campaign funds. However, if Barack Obama's choice not to receive federal campaign funds for the 2008 general election is repeated in future elections, this reason for the late scheduling of conventions will no longer be valid. Another reason for the lateness of the conventions is due to the primary calendar, which ends in early June, and the political party's desire to turn the convention into a four-day tightly scripted political rally for their nominee, which just happens to have a roll call vote for President. This includes such logistics as where each delegation sits on the convention floor, the order of speeches, how the nominee wants to present him or herself, and allows time for any negotiations in regards to the running mate. Finally, the parties also did not want to schedule their conventions around the Olympics. One reason why the Democratic Party held its 2008 convention after the two-week-long Beijing Olympics was, according to them, to "maximize momentum for our Democratic ticket in the final months of the Presidential election". But moving the conventions later into early September led to conflicts with the National Football League's season kickoff game, which opens the season on the first Thursday of September. However, the NFL accommodated the conventions and moved its games to an earlier start time in 2008, and an earlier date in 2012. In 2016, both the Republican and Democratic conventions moved to July, before the Rio de Janeiro Olympics in August. One reason why the Republican Party wanted a July convention was to help avoid a drawn-out primary battle similar to what happened in 2012 that left the party fractured heading into the general election. The Democrats then followed suit so they could provide a quicker response to the Republicans, rather than wait for more than two weeks until after the Olympics are over. The 2020 Democratic National Convention is scheduled from July 13–16, while the 2020 Republican National Convention is planned from August 24–27, with the Tokyo Olympics in between. The 2008 Green Party National Convention held in Chicago. Various third parties also hold their own national conventions. Each party sets its own rules for the participation and format of the convention. Broadly speaking, each U.S. state and territory party is apportioned a select number of voting representatives, individually known as delegates and collectively as the delegation. Each party uses its own formula for determining the size of each delegation, factoring in such considerations as population, proportion of that state's Congressional representatives or state government officials who are members of the party, and the state's voting patterns in previous presidential elections. The selection of individual delegates and their alternates, too, is governed by the bylaws of each state party, or in some cases by state law. The 2004 Democratic National Convention counted 4,353 delegates and 611 alternates. The 2004 Republican National Convention had 2,509 delegates and 2,344 alternates. But these individuals are dwarfed by other attendees who do not participate in the formal business of the convention. These include non-delegate party officials and activists, invited guests and companions, and international observers, not to mention numerous members of the news media, volunteers, protesters, and local business proprietors and promoters hoping to capitalize on the quadrennial event. The Louisiana Superdome in New Orleans was the site of the 1988 Republican National Convention, which nominated George H.W. Bush for president. In recent decades, the two major parties have held their conventions at sports stadiums and arenas. The convention is typically held in a major city selected by the national party organization 18–24 months before the election is to be held. As the two major conventions have grown into large, publicized affairs with significant economic impact, cities today compete vigorously to be awarded host responsibilities, citing their meeting venues, lodging facilities, and entertainment as well as offering economic incentives. The location of early conventions was dictated by the difficulty of transporting delegates from far-flung parts of the country; early Democratic and Whig Conventions were frequently held in the central Eastern Seaboard port of Baltimore, Maryland. As the U.S. expanded westward and railroads connected cities, Midwestern cities such as Chicago, Illinois—which since 1860 has held 25 Republican and Democratic Conventions combined, more than any other urban center in the USA—became the favored hosts. In the present day, political symbolism affects the selection of the host city as much as economic or logistical ones do. A particular city might be selected to enhance the standing of a favorite son, or in an effort to curry favor with residents of that state. For example, in 2011, Obama campaign manager Jim Messina noted: "We put the Democratic National Convention in Charlotte, North Carolina in part because we believe so deeply in" a "New South map." Likewise, New York City was selected as the host of the 2004 Republican National Convention to evoke memories of George W. Bush's leadership in the September 11 attacks. The conventions have historically been held inside convention centers, but in recent decades the two major parties have favored sports arenas and stadiums to accommodate the increasing capacity, the former because indoor arenas are usually off-season outside of WNBA sites, allowing plenty of time for preparation (the major political parties have avoided baseball stadiums ever since the 1992 Republican National Convention at the Houston Astrodome forced the Houston Astros to play 26 consecutive road games). Bids for the 2008 Republican National Convention, for example, were required to have a facility with a seating capacity of at least 20,500 people, including a convention floor of about 5,500 delegates and alternates; the Xcel Energy Center in Saint Paul, Minnesota was eventually selected. Meanwhile, approximately 84,000 people attended the last day of the 2008 Democratic National Convention at Denver's Invesco Field at Mile High. The last day of the 2012 Democratic Convention was originally also scheduled for an outdoor football stadium, but was moved indoors due to weather concerns. The last non-sporting venue to host the Democratic National Convention was San Francisco's Moscone Center in 1984. In 1996, the San Diego Convention Center in San Diego became the last non-sporting venue to host the Republican National Convention. Roll call of states during the 2008 Democratic National Convention at the Pepsi Center in Denver, Colorado. The floor of the 2008 Republican National Convention at the Xcel Energy Center in Saint Paul, Minnesota. During the day, party activists hold meetings and rallies, and work on the platform. Voting and important convention-wide addresses usually take place in the evening hours. In recent conventions, routine business such as examining the credentials of delegations, ratifying rules and procedures, election of convention officers, and adoption of the platform usually take up the business of the first two days of the convention. Balloting was usually held on the third day, with the nomination and acceptance made on the last day, but even some of these traditions have fallen away in 21st century conventions. The only constant is that the convention ends with the nominee's acceptance speech. Each convention produces a statement of principles known as its platform, containing goals and proposals known as planks. Relatively little of a party platform is even proposed as public policy. Much of the language is generic, while other sections are narrowly written to appeal to factions or interest groups within the party. Unlike electoral manifestos in many European countries, the platform is not binding on either the party or the candidate. Because it is ideological rather than pragmatic, however, the platform is sometimes itself politicized. For example, defenders of abortion rights lobbied heavily to remove the Human Life Amendment plank from the 1996 Republican National Convention platform, a move fiercely resisted by conservatives despite the fact that no such amendment had ever come up for debate. Since the 1970s, voting has for the most part been perfunctory; the selection of the major parties' nominees have rarely been in doubt, so a single ballot has always been sufficient. Each delegation announces its vote tallies, usually accompanied with some boosterism of their state or territory. The delegation may pass, nominally to retally their delegates' preferences, but often to allow a different delegation to give the leading candidate the honor of casting the majority-making vote. Before the presidential nomination season actually begins, there is often speculation about whether a single front runner would emerge. If there is no single candidate receiving a majority of delegates at the end of the primary season, a scenario called a brokered convention would result, where a candidate would be selected either at or near the convention, through political horse-trading and lesser candidates compelling their delegates to vote for one of the front runners. The best example was the 1924 Democratic Convention, which took 103 ballots. The situation is more likely to occur in the Democratic Party, because of its proportional representation system, but such a scenario has been the subject of speculation with regard to most contested nominations of both parties without actually coming to pass in recent years. It is a common scenario in fiction, most recently in an episode of The West Wing. The closest to a brokered convention in recent years was at the 1976 Republican National Convention, when neither Gerald Ford nor Ronald Reagan received enough votes in the primary to lock up the nomination. Since then, candidates have received enough momentum to reach a majority through pledged and bound delegates before the date of the convention. More recently, a customary practice has been for the losing candidates in the primary season to release their delegates and exhort them to vote for the winning nominee as a sign of party unity. Thus, the vote tallied on the floor is unanimous or nearly so. Some delegates may nevertheless choose to vote for their candidate. And in 2008 both happened: Hillary Clinton received over 1,000 votes before she herself moved to nominate Barack Obama by acclamation, officially making it a unanimous vote. Vice Presidential voting has been problematic since the beginning, as the delegates generally don't really want to deal with it, and it provides for mischief, as was the case in 1972's Democratic Convention where the vote was scattered between 50 "candidates" and 1976 Republican convention, where the vote was also scattered widely. In 1988, both parties decided to have the designated candidate nominated by "suspending the rules" and declaring him or her nominated by "acclamation." The last Vice Presidential roll call vote was at the 1984 Republican convention. If, after the first round of voting, there is no candidate with a majority of votes, subsequent roll calls are held. In between, "back room deals" can be made between candidates, swapping delegates for positions in the administration or other favors, or candidates can release their delegates to vote for whoever they personally prefer. Roll calls continue until one candidate has a majority. The record is held by the 1924 Democratic National Convention where divisions within the party concerning Prohibition led to 102 ballots between Alfred E. Smith and William G. McAdoo before the relatively unknown John W. Davis was chosen as a compromise candidate on the 103rd ballot. Every year of a Presidential election, the United States' Political parties have national conventions that result in Presidential candidates. However, candidates are not chosen by the public, but by selected Delegates from each state. Including delegates in the nomination process began after the Presidential election year of 1968, when there was widespread dissatisfaction of the presidential nominating process. The chances of candidates from major parties winning majority of the electoral votes was threatened by 3rd and 4th party movements, which resulted in the reformation of the presidential election process. Generally speaking, delegates of both major parties usually pledge their votes to a specific candidate, and those who are associated with the Democratic party and are unpledged are considered super delegates. These super delegates may include Governors who identify with the party, members of Congress, as well as members of the Democratic National Committee . Super Delegates aren't pledged to a particular candidate, and can vote for who they please. Any registered democrat is able to run to be a delegate, and wins are based on congressional votes. Once Democrats choose their delegates, they distribute delegates to each candidate evenly, according to the number of congressional district votes they get (must be at least 15%). Rule 14 of the Republican party's national rules determines the size of delegates for each state, territory, or political subdivision. Delegate selection for the Republican party must take place prior to March 1 or after the 2nd Saturday in June in the year that the convention is held. The republican party uses a "Proportional Allocation" rule, which states that delegates should be based on the statewide votes or the number of congressional district votes in proportion to the number of votes received by each candidate. Also, each state must advocate to have an equal number of men and women in its delegation. 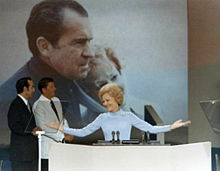 First Lady Pat Nixon speaking at the 1972 Republican National Convention. She was the first Republican First Lady to do what is now considered common practice. Michelle Obama speaking at the 2008 Democratic National Convention. Minor figures in the party are given the opportunity to address the floor of the convention during the daytime, when only the small audiences of C-SPAN and other cable television outlets are watching. The evening's speeches – designed for broadcast to a large national audience – are reserved for major speeches by notable, respected public figures; the speakers at the 2004 Democratic convention included Ted Kennedy, a forty-year veteran of the United States Senate, and Jimmy Carter, a former Democratic President, while at the Republican convention speakers included Governor Arnold Schwarzenegger of California and Governor George Pataki of New York, two of the largest states in the nation. The organizers of the convention may designate one of these speeches as the keynote address, one which above all others is stated to underscore the convention's themes or political goals. For instance, the 1992 Democratic National Convention keynote address was delivered by Georgia Governor Zell Miller, whose stories of an impoverished childhood echoed the economic themes of the nominee, Arkansas Governor Bill Clinton. The 1996 Republican National Convention was keynoted by U.S. Representative Susan Molinari of New York, intended to reassure political moderates about the centrism of the nominee, former Senator Bob Dole. And the 2004 Democratic National Convention featured Senator Barack Obama, whose speech brought the future President national recognition for the first time. Uniquely, Miller, by then a Senator, would also be the keynote speaker at the 2004 Republican convention, despite still maintaining his Democratic registration. The final day of the convention usually features the formal acceptance speeches from the nominees for President and Vice President. Despite recent controversy maintaining that recent conventions were scripted from beginning to end, and that very little news (if any) comes out of the convention, the acceptance speech has always been televised by the networks, because it receives the highest ratings of the convention. In addition, the halls of the convention are packed at this time, with many party loyalists sneaking in. Afterwards, balloons are usually dropped and the delegates celebrate the nomination. 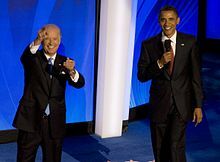 Barack Obama and Joe Biden appear together at the 2008 Democratic National Convention. 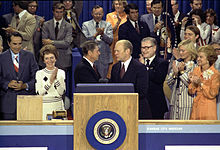 Primary foes Ronald Reagan (left) and Gerald Ford (right) shake hands during the 1976 Republican National Convention, the last major party convention whose outcome was in doubt. In the early 19th century, members of Congress met within their party caucuses to select their party's nominee. Conflicts between the interests of the Eastern Congressional class and citizens in newer Western states led to the hotly contested 1824 election, in which factions of the Democratic-Republican Party rejected the caucus nominee, William H. Crawford of Georgia, and backed John Quincy Adams, Henry Clay, and Andrew Jackson (all of whom carried more states than Crawford in the election) instead. In 1831 the Anti-Masonic Party convened in Baltimore, Maryland to select a single presidential candidate agreeable to the whole party leadership in the 1832 presidential election. The National Republican and Democratic Parties soon followed suit. Conventions were often heated affairs, playing a vital role in deciding each party's nominee. The process remained far from democratic or transparent, however. The party convention was a scene of intrigue among political bosses, who appointed and otherwise controlled nearly all of the delegates. Winning a nomination involved intensive negotiations and multiple votes; the 1924 Democratic National Convention required a record 103 ballots to nominate John W. Davis. The term "dark horse candidate" was coined at the 1844 Democratic National Convention, at which little-known Tennessee politician James K. Polk emerged as the candidate after the failure of the leading candidates—former President Martin Van Buren and Senator Lewis Cass—to secure the necessary two-thirds majority. A few, mostly Western, states adopted primary elections in the late 19th century and during the Progressive Era, but the catalyst for their widespread adoption came during the election of 1968. The Vietnam War energized a large number of supporters of anti-war Senator Eugene McCarthy of Minnesota, but they had no say in the matter. Vice President Hubert Humphrey—associated with the unpopular administration of Lyndon B. Johnson—did not compete in a single primary, yet controlled enough delegates to secure the Democratic nomination. This proved one of several factors behind rioting which broke out at the Democratic convention in Chicago. Media images of the event—angry mobs facing down police—damaged the image of the Democratic Party, which appointed a commission headed by South Dakota Senator George McGovern to select a new, less controversial method of choosing nominees. The McGovern–Fraser Commission settled on the primary election, adopted by the Democratic National Committee in 1968. The Republicans adopted the primary as their preferred method in 1972. Henceforth, candidates would be given convention delegates based on their performance in primaries, and these delegates were bound to vote for their candidate. As a result, the major party presidential nominating convention has lost almost all of its old drama. The last attempt to release delegates from their candidates came at the 1980 Democratic National Convention, when Senator Ted Kennedy of Massachusetts sought votes of delegates held by incumbent President Jimmy Carter. The last major party convention whose outcome was in doubt was the 1976 Republican National Convention, when former California Governor Ronald Reagan nearly won the nomination away from the incumbent President, Gerald Ford. While rank and file members had no input in early nominations, they were still drawn by the aura of mystery surrounding the convention, and networks began to broadcast speeches and debates to the general public. NBC affiliate W2XBS in New York City made the first telecast of a national party convention, of the 1940 Republican National Convention in Philadelphia, Pennsylvania, and the other two of the Big Three television networks soon followed. As NBC News anchorman John Chancellor stated just before the start of the 1972 Democratic National Convention, "convention coverage is the most important thing we do. The conventions are not just political theater, but really serious stuff, and that's why all the networks have an obligation to give gavel-to-gavel coverage. It's a time when we all ought to be doing our duty". With the rise of the direct primary, and in particular with states moving earlier and earlier in the primary calendar since the 1988 election, the nominee has often secured a commanding majority of delegates far in advance of the convention. As such, the convention has become little more than a coronation, a carefully staged campaign event designed to draw public attention and favor to the nominee, with particular attention to television coverage. For instance, speeches by noted and popular party figures are scheduled for the coveted prime time hours, when most people would be watching. News anchor Ted Koppel (pictured in 2002), who midway through the 1996 Republican National Convention told viewers that he was going home because it has become "more of an infomercial than a news event". There was a time when the national political conventions were news events of such complexity that they required the presence of thousands of journalists ... But not this year ... This convention is more of an infomercial than a news event. Thus in subsequent election years, the broadcast networks began increasingly limiting their coverage, arguing that those interested can watch the proceedings on a cable news network such as CNN, MSNBC, or the Fox News Channel. In 2004, the big three networks started devoting only three hours of live coverage to each political convention, although there were highlights of speeches during the networks' morning and evening newscasts. However, many journalists still believe that the public should be exposed to political conventions. PBS, of note, continues to provide full prime-time coverage of the political conventions, although it breaks away from minor speakers and mundane business for analysis and discussion. C-SPAN broadcasts both major conventions in their entirety, and the parties stream their conventions on the internet. The presence of journalists at presidential nominating conventions have increased with the television networks. In 1976, the Democratic Convention consisted of 3,381 delegates and 11,500 reporters, broadcasters, editors and camera operators. This is on par with the increase in the number of televisions in American's homes. In 1960, 87 percent of people had a television, compared to 98 percent by 1976. By the 1992 conventions, network coverage increased from three networks (NBC, ABC and CBS) to five networks (NBC, ABC, CBS, Fox and PBS). At the 1996 Republican National Convention there were approximately seven journalists per one delegate, or about 15,000 journalists. The increase of the media at these conventions originally led to a growth in the public's interest in elections. Voter turnout in the primaries increased from less than five million voters in 1948 to around thirteen million in 1952. By broadcasting the conventions on the television, people were more connected to the suspense and the decisions being made, therefore making them more politically aware, and more educated voters. When scholars studied the 1976 conventions they determined that by watching nomination conventions, even viewers that were not previously very politically active developed a much stronger interest in the election process and the candidate. 1852 Free Soil Pittsburgh 1852 John P. Hale Most Free-Soilers joined the Republican Party after its foundation in 1854. 1856 American Philadelphia 1856 Millard Fillmore The anti-immigrant American (or Know Nothing) Party endorsed Fillmore in February 1856, followed by the Whigs in September. The two right-hand columns show nominations by notable conventions not shown elsewhere. Some of the nominees (e.g. the Whigs before 1860 and Theodore Roosevelt in 1912) received very large votes, while others who received less than 1% of the total national popular vote are listed to show historical continuity or transition. Many important candidates are not shown here because they were never endorsed by a national party convention (e.g. William Henry Harrison in 1836, George C. Wallace in 1968, John B. Anderson in 1980 and Ross Perot in 1992). Note that there is no organizational continuity between the American Parties of 1856 and 1972, the Union Parties of 1860, 1864, 1888 and 1936, or the Progressive Parties of 1912–16, 1924 and 1948–52. .
M "Middle of the Road" faction of the People's Party, who opposed fusing with the Democrats after 1896. 1932 Chicago Franklin Roosevelt Chicago Herbert Hoover Omaha (Farmer-Labor) Jacob S. Coxey, Sr.
For American Party (or American Independent Party) conventions since 1968, see American Party (1969). For Communist Party and Workers' Party conventions, see National conventions of the Communist Party USA. The Prohibition Party was organized in 1869. The Socialist Party of America (1901–1972) resulted from a merger of the Social Democratic Party (founded 1898) with dissenting members of the Socialist Labor Party (founded 1876). The Socialist Party of America stopped running its own candidates for President after 1956, but a minority of SPA members who disagreed with this policy broke away in 1973 to form the Socialist Party USA (SPUSA). ¶ Note that the years refer to the relevant presidential election and not necessarily to the date of a convention making a nomination for that election. Some nominating conventions meet in the year before an election. In 1999, the United States Taxpayers' Party changed its name to the Constitution Party. The individual article about a Libertarian convention after 1980 or a Green Party convention after 1996 is linked to its respective city in the table below. Cities linked for Constitution and U.S. Taxpayers' Party conventions lead to individual sections of Constitution Party National Convention. ^ "NFL season opener yields to McCain speech". Reuters. March 26, 2008. ^ Jaffe, Alexandra (January 23, 2015). "Democratic National Convention date set". CNN.com. Retrieved August 25, 2015. ^ "Exclusive: Democrats, anticipating heated primary, set earlier 2020 convention date". CNN. Retrieved June 15, 2018. ^ "2020 Republican National Convention dates announced". WCNC.com. October 1, 2018. ^ Evan McMorris-Santoro (November 29, 2011). "Team Obama Likes Its Chances: AZ, VA, NC Could Go Democrat In 2012 (VIDEO)". Talking Points Memo. Retrieved 2012-01-06. ^ Dena Bunis. "News: Anaheim asked to make bid for Republican convention - OCRegister.com". Ocregister.com. Archived from the original on October 15, 2008. Retrieved 2009-10-25. ^ Lloyd, Robert (August 29, 2008). "Barack Obama, Al Gore raise the roof at Invesco Field". Los Angeles Times. Retrieved 2009-10-31. ^ "REPUBLICANS: Ford Is Close, but Watch Those Trojan Horses". Time. August 2, 1976. Retrieved 2010-05-27. ^ "Constitutional Safeguards in the Selection of Delegates to Presidential Nominating Conventions". The Yale Law Journal. 78 (7): 1228–1252. 1969. doi:10.2307/795003. JSTOR 795003. ^ a b c d "Who gets to be a Delegate at the Presidential Nominating Conventions?". ^ Paletz & Elson (1976). "Television Coverage of Presidential Conventions: Now You See It, Now You Don't". Political Science Quarterly. 91 (1): 109–131. doi:10.2307/2149161. JSTOR 2149161. ^ a b Bennet, James (15 August 1996). "'Nightline' Pulls the Plug on Convention Coverage". New York Times. Retrieved 2010-05-27. ^ "Political conventions lose drama, TV audience". 2004-07-25. ^ a b Trent & Friedenberg (2004). Political Campaign Communication Principles & Practices. Lanham, MD: Rowman & Littlefield Publishers, Inc.
^ Kraus, Sidney (1979). The Great Debates. Indiana University Press. ^ Trent & Friedenberg (2004). Political Campaign Communication Principles and Practices. Lanham, MD: Rowman & Littlefield Publishers, Inc.
^ Valley, David (1974). "Significant Characteristics of Democratic Presidential Nomination Acceptance Speeches". Central States Speech Journal. 25: 56–62. doi:10.1080/10510977409367769. ^ Kraus, Sidney (1979). The Great Debate. Indiana University Press. Chase, James S. Emergence of the Presidential Nominating Convention, 1789–1832 (Houghton Mifflin: 1973). Congressional Research Service. Presidential Elections in the United States: A Primer. (Washington, Congressional Research Service, April 17, 2000).